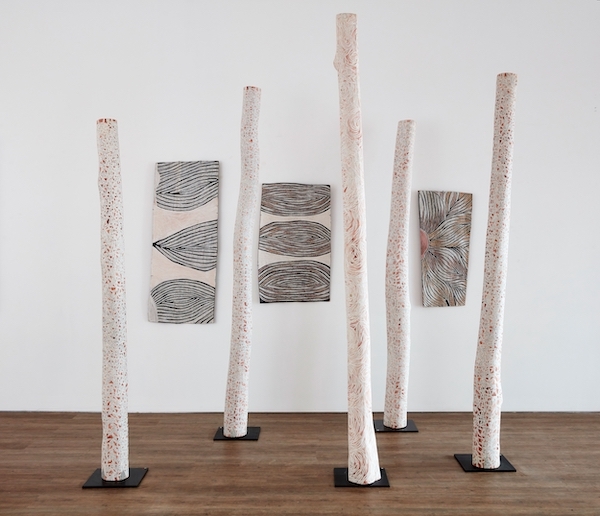 ‘First Ladies’ installation, bark paintings by Dhuwarrwarr Marika, Larrikidj by Djirrirra Wunungmurra. Courtesy: the artist and Vivien Anderson Gallery. Photo: Simon Anderson. A celebration of the first Yolgnu woman bark painter in eastern Arnhem land, Dhuwarrwarr Marika, and the first female Yolngu artist to innovate her own Miny’tji, Djirrirra Wunungmurra.